CANTON, Mass. – The pitch was slick from two days worth of rain, but the Canton defense showed no ill effects and zero slip-ups, as it corralled Sharon’s top two attacking threats, Alex Rabb and Ally Filipkowski, limiting the Eagles to only a couple clear scoring chances. It was a major turnaround for the Bulldogs, who had allowed six goals last time out against Milford. The back four, with help from the midfield, held firm on Saturday morning at World War II Veterans Memorial Field and Canton pulled out a 2-0 victory that edges the Bulldogs closer to a spot in the state tournament. Chances were at a premium for both teams in the first half. The Bulldogs has the first shot on goal when Tessa Cudmore’s shot was handled by Sharon keeper Natalie Gray. A corner three minutes later from Sarah Connolly had to be cleared off the line by Amanda Klayman and then Lauren McCabe had the rebound saved by Gray in the bottom corner. The Bulldogs’ best scoring opportunities were coming from Connolly’s set piece deliveries. She fired in a long free kick that Gray caught cleanly and then in the 27th minute she was credited with the opening goal when her corner was deflected off the leg of a Sharon defender and just over the line. The defensive effort for Canton started with the midfield trio of Julia Hamilton and freshmen cousins Lauren and Morgan McCabe, who bottled up Filipkowski by sending multiple players at the junior playmaker as often as possible. Even without Riley Duserick, who was out with an injury, the Bulldogs put the clamps on the Sharon midfield in the first half. When the Eagles did get the ball forward, Rabb was regularly alone up top surrounded by Connolly and Carly Hutchinson. At halftime, the Eagles made an adjustment to try and get more runners out wide and it created Sharon’s best chance in the 46th minute. Filipkowski managed to shrug off the attention of the Bulldogs and slid a pass into Victoria Zambello angling in from the right wing but Canton keeper Kathryn Doody was off her line quick to block the shot. Ally Steinberg also started to find space on the right side going one-on-one with Canton right back Sarah Collins and created a couple dangerous crosses that Doody and the defense managed to clear in front of Rabb. Canton had its chances to close out the victory. Cudmore was causing problems with her speed, running at the Sharon back line, and Lauren Fitzpatrick added some good minutes off the Bulldogs bench. Cudmore nearly doubled the lead in the 48th minute when she chased down a deflected pass but it was saved by back-up keeper Isabella Berger and the follow-up by Hannah Link sailed over the bar. In the 52nd minute Cudmore had another good look but her curling effort from the edge of the box smacked off the bar. In the 64th minute, Cudmore set up the goal that sealed the win. She hustled to keep a loose ball alive on the near side of the box and laid a pass into the path of Catherine Leonetti, who had just come into the game, and she hit it first time off the underside of the crossbar and across the line. With the win Canton (7-6-1, 7-5-1) moves back into second place in the Davenport, one point ahead of Foxboro, which the Bulldogs will face on Tuesday afternoon. Sharon (5-9-1, 4-9-1) will step out of the league on Monday for a trip to Norwood. FOXBORO, Mass. – There was the hint of a smile that played across junior forward Ally Steinberg’s face when the second goal found its way to the back of the net, but rather than join in the raucous celebrations of her teammates she immediately followed her shot, grabbed the ball and ran it back to midfield to get the game restarted. “I’m not one to really celebrate,” said Steinberg after the game. 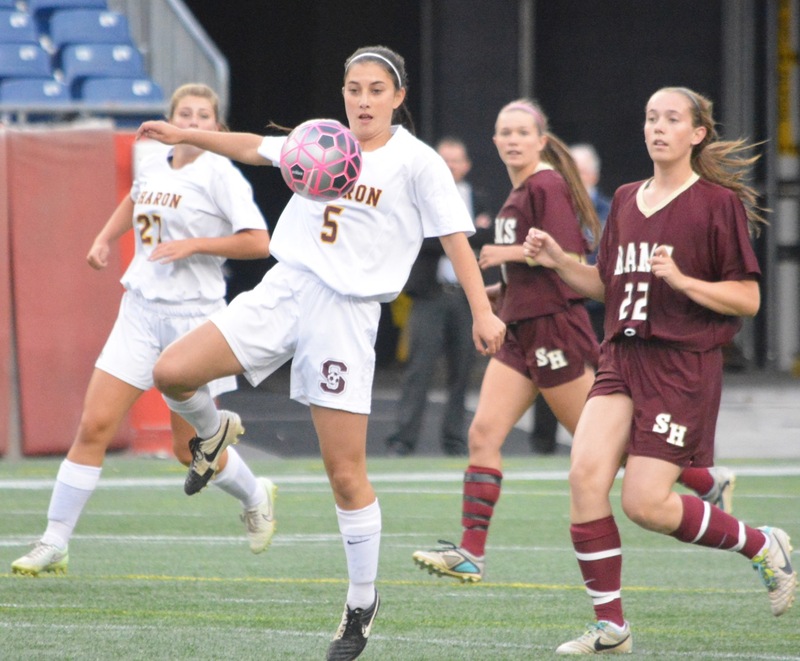 The Eagles did not need her to celebrate on Monday night, but they did need her in front of goal, as Steinberg scored twice in the final six minutes to steal a point for Sharon in a 2-2 draw with Shepherd Hill at Gillette Stadium. The Eagles controlled play for much of the game with the lion’s share of possession and a number of scoring opportunities that they failed to convert. Despite a strong start, it was the Rams that jumped into the lead in the 12th minute. A long ball to the forward pulled junior Samantha Rabb into the channel where she conceded a free kick on the edge of the box. The kick was played into the middle and Sharon failed to clear with several attempts allowing the ball to fall to Hailey Demers and she looped it over the head of Sharon keeper Natalie Gray. As if one sucker punch was not bad enough, the Eagles received another just five minutes later when Rebecca Nguyen slipped a through ball between the defenders to Rachel Bianculli and she made no mistake with her finish to make it 2-0. In the 18th minute, Alexandra Filipkowski had Sharon’s first shot after Shepherd Hill failed to clear a cross from Rose Wald. It took another 15 minutes before the Eagles would get another chance and this one Steinberg headed onto the roof of the net from five yards out off a Victoria Zambello free kick. At haltime, Lavien spoke to his team about continuing to play the way that it started and to keep pushing to try and get back into the game. He also reminded the Eagles that this was a unique opportunity that they needed to make count. The Eagles also adjusted the formation, dropping Filipkowski into midfield, Amanda Klayman to the wing, and moving Steinberg up top along with Zambello. The move worked as Sharon attacked time and again and started to look dangerous each time that it went forward. Zambello was the primary target early in the half and could possibly have had a second half hat trick with a little better luck. In the 52nd minute she ran onto a pass in the middle, cut pat a defender onto her left foot inside the box and fired a low angled shot that seemed certain to cut the lead in half, until Rams freshman keeper Alyssa Trueman somehow got a fingertip to it and kept it out. Again in the 21st minute, Zambello was denied. This time she flicked a loose ball over the prone Trueman only to have her shot kicked off the line by Julia Dandridge. With six minutes remaining, the goal finally came and it was Steinberg that provided the breakthrough. A cross from the right by Alex Miller picked out Steinberg inside the six-yard box and she found the corner to make it 2-1. Just three minutes later she tied the game. This time it was Zambello who olayed provider with a cross, again from the right, that was whipped in low on the edge of the six. Steinberg needed only one touch to knock it past Trueman and tie the game at 2-2. There was still time for another chance to fall to Zambello, but this was not to be her night to get on the score sheet. The junior knocked it over the bar from close range and then had another chance denied by the combination of Trueman and Dandridge in the final minute. Sharon (3-5-1, 2-5-0) travels to Taunton on Wednesday night. Attleboro, 1 @ Canton, 2 – Final – San Papakonstantino scored both goals for the Bulldogs in the win. Mansfield, 0 @ Oliver Ames, 1 – Final – OA senior Chris Romero flicked in Matt Campbell, who netted his first goal of the year for the Tigers in a battle of division leaders. Taunton, 1 vs. New Bedford, 2 – Final – Austin Botelho scored the lone goal for Taunton on an assist by Derek Pereira. Canton, 1 @ Attleboro, 2 – Final – Chloe Vieira scored the first goal for the Bombardiers off an assist by Breanna Eddy. 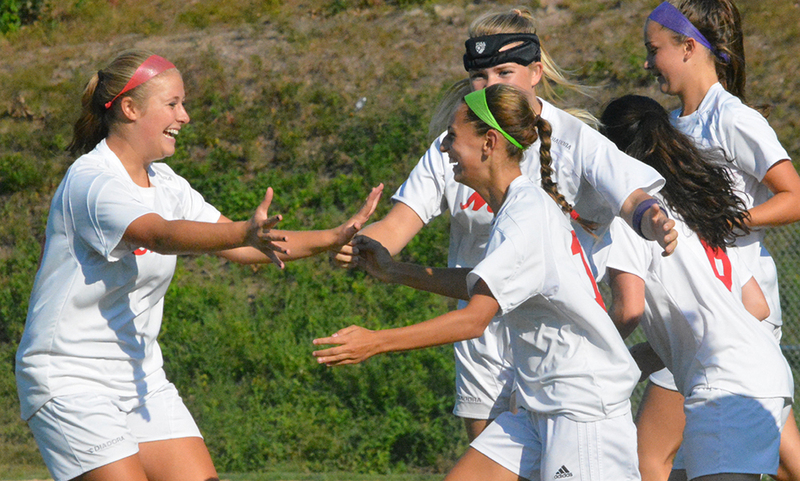 Paige Medeiros scored the winner with a 20-yard free kick that went in off the post. Madison Brown made 10 saves to get the win. King Philip, 1 @ Hopedale, 2 – Hopedale scored four minutes into the game, but 11 minutes later Rachel Hogan equalized for KP off and assist by Lauren Hehn. The hosts scored the winner with 90 seconds left. Emma Durant played well in net for the Warriors, according to head coach Gary Pichel. Oliver Ames, 0 @ Mansfield, 0 – Final – Regan Benton and Bethany Dunk split time in goal for the Tigers and Emily Gaumond picked up the clean sheet for the Hornets. Sharon, 2 vs. Shepherd Hill Regional 2 – Final – Ally Steinberg scored a pair of goals in the final six minutes of the game to earn a draw for the Eagles. The first goal was a header off a cross by Alex Miller and the second on a low cross to the edge of the 6-yard box by Victoria Zambello with only a few minutes left in the game. Taunton, 4 @ New Bedford, 0 – Final – Alana Vincent, Mariah O’Gara, Olivia Sweeney, and Mariah Dwyer scored the goals for the Tigers. O’Gara also added an assist as did Amanda Pugh. Kayla Wenworth made three saves for the shutout. Attleboro, 0 @ Canton, 3 – Final – The Bulldogs won 25-7, 25-10, 25-11. Elizabeth Hamilton led Canton with 14 kills, Olivia Devoe had 14 digs, and Cassie Loftus and Nicole Poole combined for 31 assists. Franklin, 3 @ Milford, 2 – Final – Franklin was able to pick up a 25-18, 23-25, 22-25, 25-17, 15-10 win on the road. Franklin’s Beth Neal had 14 kills, 14 assists and five blocks, Aubrie Kutil added 11 kills, Dayna McCue had 29 digs and eight aces and Sam Campbell added 16 digs, three kills and an ace for the Panthers. King Philip, 3 @ Stoughton, 0 – Final – King Philip picked a 25-13, 25-20, 25-23 sweep on the road. Micaela Murray had seven service points in the first game and finished with 10 digs, Carly Adams had nine service points in game two and Josie Rowean had 13 total kills and eight service points, including three aces, in game three. Mansfield, 3 @ Oliver Ames, 0 – Final – Mansfield won 25-21, 26-24, 25-18. Catherine Heavey had 30 assists and 12 service points for the Hornets. Sarah Mullahy added seven kills and Jess Haradon had five kills, nine service points, and nine digs. North Attleboro, 2 @ Foxboro 3 – Final – Molly Manning, Lily Daly, and Meredith Cronin scored the goals for Foxboro. Franklin, 3 @ Milford, 0 – Final – Annie Walsh led Panthers with a goal and an assist. Cassi Ronan and Diana Griffin added the other two goals. Samantha Jones and Kate D’Entremont made one save each for the shutout. King Philip, 1 @ Stoughton, 1 – Final – Olivia Schlehuber scored the goal for the Black Knights, while Caitlin Donahue had the goal for the Warriors. Abby Campbell made 12 saves for KP and Kara Ploss made seven for Stoughton. Mansfield, 2 @ Oliver Ames, 1 – Final – Nicole Walker tied the game for the Tigers a minute after Mansfield took the lead. Cassie Gavin made 11 saves for OA in the loss. Taunton, 159 @ North Attleboro, 144 – Final – North Attleboro was led by Dylan Kane with a 34. Tyler Sinacola shot a 35 for the Rocketeers, while Robbie Congdon had a 37 and Bryan Harris had a 38. Taunton was led by Justin Proto’s 36. The Tigers also got a 40 from Mike Volkmann, a 41 from Jason Stern and a 42 from Ryan Oberg. Sharon, 165 @ Milford, 162 – Final – Ryan Tomaso shot a three under par 32 to lead the the Hawks. Sharon was led by Max Avratin and Ryan Crooks, who each shot 39s. Canton, 0 @ Sharon, 2 – Final – Jake Goloboy opened the scoring for the Eagles off an assist from Shane Brandes in the 15th minute and Sonny Somdah added an unassisted goal 15 minutes later to double the lead. Sharon, 5 vs. Norwood, 2 – Final – Amanda Klayman, Victoria Zambello, Ally Filipkowski, Ally Steinberg, and Alex Rabb all scored goals for the Eagles in the non-league win. Freshman Lydia Chase made 11 saves in her second varsity appearance. Canton, 3 @ Sharon, 0 – Final – Canton picked up a 25-18, 25-8, 25-13 division sweep. Elizabeth Hamilton led an entire team effort with 13 kills. Head coach Pat Cawley said Kaitlin McCarthy played great two way ball and Maria Mackie, Julia Panico, Kehla Minkin and Erika Lum all played great defense. Oliver Ames, 1 @ Foxboro, 1 – Final – Dimitra Efremidis set up Nicole Walker for Oliver Ames’ lone goal, which came in the first half. Foxboro freshman Lily Daly tied the game off an assist from Meri Cronin late in the second half. 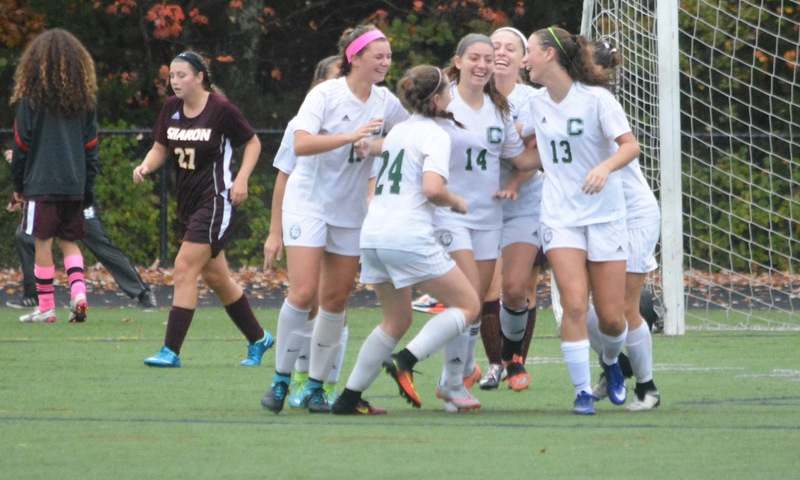 Franklin,1 @ King Philip, 0 – Final – Christina Quinn scored nine minutes into the game and it turned out to be the game-winner for the Panthers. KP goalie Abby Campbell made 14 saves to keep the Warriors in the game in the second half. Franklin goalie Sam Jones made a save with 1:30 left to preserve the win. Milford, 0 @ Stoughton, 1 – Final – Courtney Campbell scored with five minutes left in the game off an assist from Mia Russell to lift the Black Knights. Kara Ploss had the shutout in goal for Stoughton while Milford goalie Emily Smith also had a strong game. Oliver Ames, 157 @ Stoughton, 185 – Final – Oliver Ames’ Jack Green shot a match-low 37 to lead the Tigers while Steven Tasho, Ryan McGarry and Mark Bissonette each carded a 40. Josh Roos shot a 44 for the Black Knights. Milford, 6 @ Hopedale, 3 – Final – In a non-league game against rival Hopedale, the Scarlet Hawks picked up a 6-3 win in match play format. Ryan Tomaso led Milford with a 33 while Anthony Arcudi and Zach Tammaro each shot 38. Franklin, 174 @ Taunton, 162 – Final – Taunton’s Mario Wilson carded a match low round of 37 for the Tigers. King Philip, 161 @ North Attleboro, 166 – Final – Todd Bushway and Sebastian Ladoulis led the way for the Warriors, each shooting 39. Robbie Congdon shot a team-low 39 for the Rocketeers. Attleboro, 187 @ Sharon, 170 – Final – Ryan Crooks and Max Avratin both carded a 40 on the day, which was the low score for the match. The Bulldogs have been building with a young roster under Kate Howarth, who is entering her third year in charge, and that youth has created depth for a team that is looking to challenge OA and Foxboro for the league title. The experience on the pitch together has Howarth believing that this could be a year to watch out for Canton. Sophomore Riley Duserick returns after earning all-star plaudits during her rookie season and she will be joined by midfielders Sarah McQuarrie and Sarah Connelly and forward Tessa Cudmore. Howarth said, “If we play our game I think we will be able to be a very competitive team! We are talented and athletic!” The Bulldogs will try to turn that athleticism into wins. Foxboro reached the second round of the playoffs only to run into perennial Div. 2 power Medfield for the second year in a row. With a number of young players returning with more experience, the Warriors will be hoping to chase down the Davenport title that they narrowly missed out on last year. Lily Sykes will be the key player returning. The sophomore led the league with 24 goals last year from her midfield position and she will be pairing up with junior Kristen Bortolotti, who is back for her third season on varsity. Goalie Hallie Canfield is back as is Carolyn Will in the center of midfield. Youth was the story for Foxboro last year, but this season head coach Kaitlin Lamothe-Vaughn will only have one freshman on the roster, Alex Stamatos, who will step in and start for the Warriors on defense. Injuries have plagued the Hawks in recent years with important players missing significant time with ACL tears and assorted other ailments. For a team that isn’t as deep as its rivals that can be a huge issue. This year, Milford coach Jay Mastaj believes that he has a talented, and young, roster that can get Milford back into the playoffs and his goal is to get them a home tournament game. One of the keys will be senior Katie Brown, who moves from midfield to forward this season alongside junior Kristin Franzini. Nicole Dahlgren will be back in the center of midfield to break up play and Milford returns almost all of its back four, which all saw a lot of playing time as freshmen last season. Christine Pye is also back in goal to help, Mastaj hopes, make Milford a tough team to play against this season. Confidence is high around the Oliver Ames soccer field this preseason as the Tigers return the majority of last year’s Davenport Division champions and there are thoughts that this squad could be capable of getting back to the South final as OA did three years ago. One reason for optimism is the return of senior defender Delaney Benton for a full season. Benton is a two-time HockomockSports.com Best XI defender, who missed almost a month of last season. In the midfield, OA will be relying on junior Francesca Calabraro, the reigning Underclassman of the Year, who will run the show for the Tigers in the center of the pitch. There is rare depth at goalie for OA with head coach Britt Sellmayer saying he has three players he can count on and up front junior Kiana Lozzi has strength and skill to hold the ball up or finish. Sellmayer comes into the season confident he has a squad to challenge even in the loaded D1 South. The Eagles struggled through 2014, but head coach Jon Lavien is confident that the roster is improving with experience and he is talking about the postseason for Sharon in 2015. Victoria Zambello returns for Sharon after a league all-star caliber season. She will play both at forward and the midfield alongside returning starter Ally Filipkowski and junior midfielder/stopper Ally Steinberg. Brenna Pittman is also back to captain the defensive unit. In addition, twins Alex and Sam Rabb, as well as Sabrina Robbins and Anna Crosby add youth with club experience to the roster. Lavien is also hoping the return of captain Abby Roseman from an ACL injury will provide a boost to the team’s lineup. He is very excited about the potential in his roster and hopes for a quick turnaround from last year’s struggles. Stoughton had a rough 2014 and new coach Tara Daniels has had a short preseason to get things together before the start of a new campaign. Daniels will be counting on the leadership of her three captains to help get the roster in shape ahead of the season. 2014 Hockomock all-star Marissa Williams returns in goal where she backstops a defense that is led by fellow senior captain Samantha Tullis. Just in front of the defense is senior midfielder Taryn Bates. Defense and conditioning have been the primary focus of preseason work as Daniels builds a defense that will be hard to play against and competitive in the Hock.